Welcome to a brand new series on Life+Style+Justice: Brands I Believe In. Since I stopped doing sponsored posts, I haven't been sharing many clothing or goods recommendations. I want to start popping in to this platform from time to time to share un-sponsored reviews of products that I love from truly ethical brands that I believe in. Molly and I first connected over her online shop, Fair + Simple: a boutique full of carefully sourced and fairly made gifts from all over the world. I loved the business model: You buy someone a Fair + Simple gift card, give it to them for their birthday/Christmas/wedding/special occasion, and they can go to the website to choose any gift they'd like. 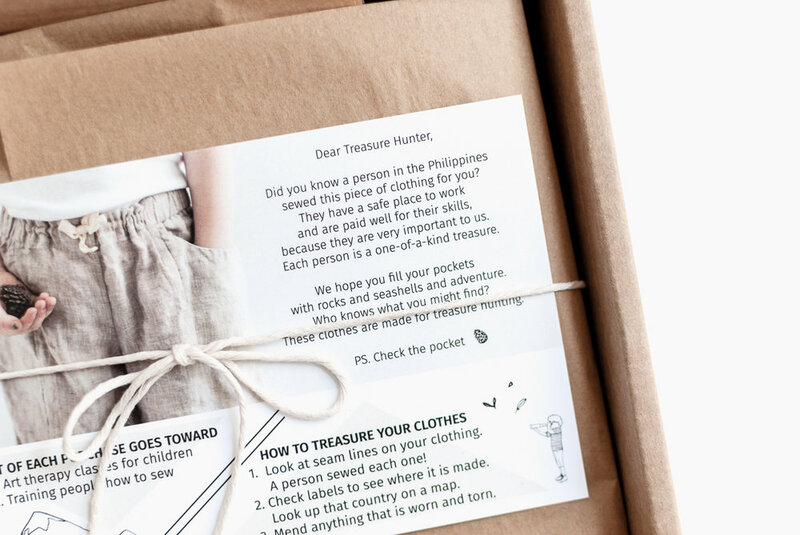 It's ethical gift-giving made easy, in a way that lets people choose the object they'll love, cherish, and use the most. I loved it. Molly has been sending work to the women at A Beautiful Refuge for years now: custom screen printed totes and wall banners, and, more recently, a linen home goods line. The women in the shop love "Ate Molly"- they've facetimed, swapped photos of kids. The ABR women are so proud every time I pull up the Fair+Simple website and show them one of their products listed for sale with beautiful professional photographs. I've always found it easy to talk to Molly- it feels like we've got hearts on the same wavelength. On one phone call, Molly shared her dream of creating an ethically made children's line, and I shared my goal of beginning to manufacture not only home goods and screen printed tees, but garments here in the Philippines. And so, Fair + Little was born. Molly's main vision for Fair + Little is to open up the conversation of 'who made my clothes' with children: "I personally hadn't given a thought to who made my clothes until I was in my early 20s. Once I started asking questions, my purchasing practices made a big shift as I began to realize the negative impact a clothing item can make on people and planet. If we teach our child to turn over a tag and consider the person behind the product, awareness can happen very early. It can be as simple as noticing the country of origin, pointing out a seam that was made by a human, and looking at the material content. We don't have to teach children all the answers, but at least they can start to ask the questions themselves." Fair + Little includes skirts, pants, capris, and the sweetest little dress, all made of 100% linen. There are also 3 tee shirts (all made from deadstock fabric sourced here in the Philippines, and illustrated by my favorite artist in the Philippines, my good friend Elle). One of the things that I love most about Fair+Little is the fact that the prices are affordable. It's really important for me, personally, to work toward more inclusive ethical fashion choices and at $16-$36 these pieces fit the bill. I know personally how hard Molly worked to crunch the numbers to buy really beautiful quality fabric, pay fair wages to the women who made the garments, and cover all the expenses that come along with manufacturing, and still offer prices that many parents will easily be able to afford. Molly designed and graded each pattern herself, wear-testing each design on her own kids. She chose a nature-based, treasure hunting theme. There is also an undercurrent of gender equality present in the design. Molly says It's always bothered her how girls clothing often comes with fake pockets, but this is rarely found in boys clothing. "Girls need pockets too, and not everything needs to be pink or purple with a princess on it". I have to admit that I teared up a little when I say the images of the garments when they made their way from the Philippines to the Oregon coast for a photoshoot. These clothes are everything I would have wanted as a child. I lived outdoors, building forts in the woods, collecting pressed flowers, insects, rocks, and fossils, picking berries and fresh veggies from my families garden for snacks. I wore boys' camouflage cargo pants because I wanted pockets to carry my pocketknife and other outdoor survival tools, just like my younger brothers. It's beautifully nostalgic for me to see wild and free kids stuffing the pockets of their Fair + Little garments with shells and treasures. I've struggled in the past year with finding the information I want about ethical brands. That's why I took down my shopping directory here on Life+Style+Justice: I just didn't know that I could guarantee that the brands I were recommending were 100% up to the standards that I want to see for wages, materials, and more. That makes sharing Fair + Little SO satisfying. Because I worked so closely with Molly on this project, I know the details behind every aspect of production. I know exactly the amount that each seamstress was paid. I know where each material came from- I could take you to meet the vendor in a tiny stall in the market in Binondo where I purchased biodegradable coconut-shell buttons, and I could show you the warehouse where I found the tee shirt fabric- discarded from a local factory. "It has not been an easy road to bring Fair+Little to life, but seeing children learn about who made their clothes has been worth it. It is a privilege to be the first encounter with shopping for good in some cases. It is so rewarding to hear stories of kids telling others people about what makes their pants or dress with big pockets so special. Change in the apparel industry happens slowly, but it can also happen EARLY." Each Fair+Little purchase comes with an information card designed for kids (yes, this also made me cry, because it's so beautiful and pure). If you have any questions at all about Fair+Little, leave them in the comments below! Either Molly or myself can share whatever additional information you'd like to know about the brand. Thanks so much for reading, and I genuinely hope you'll follow and support the work that Molly is doing to bring ethical shopping to kids!